The elite saves itself, the strong murder the weak and the weak shed their humanity to survive or drown in agony at sea: 200 years after the sinking of the 'Medusa,' the chilling story is still relevant. 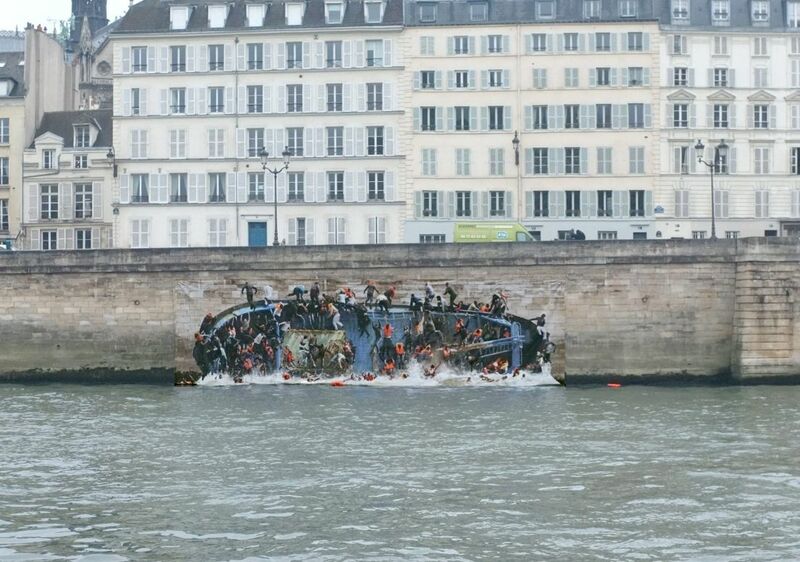 Three weeks ago, French artist Pierre Delavie launched his new work on the banks of the Seine, across from the Ile de la Cite, the historic center of Paris. Called the "Lampedusa Raft", the gigantic work is an enlargement of a photo taken by the Italian navy in May 2016, documenting a boat sinking in the Mediterranean. 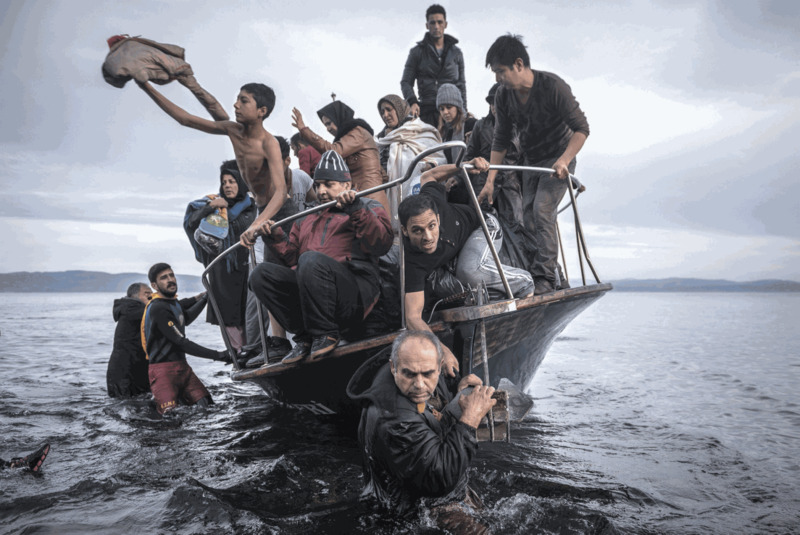 The refugees on board the rickety vessel look helpless, desperately trying to save themselves. 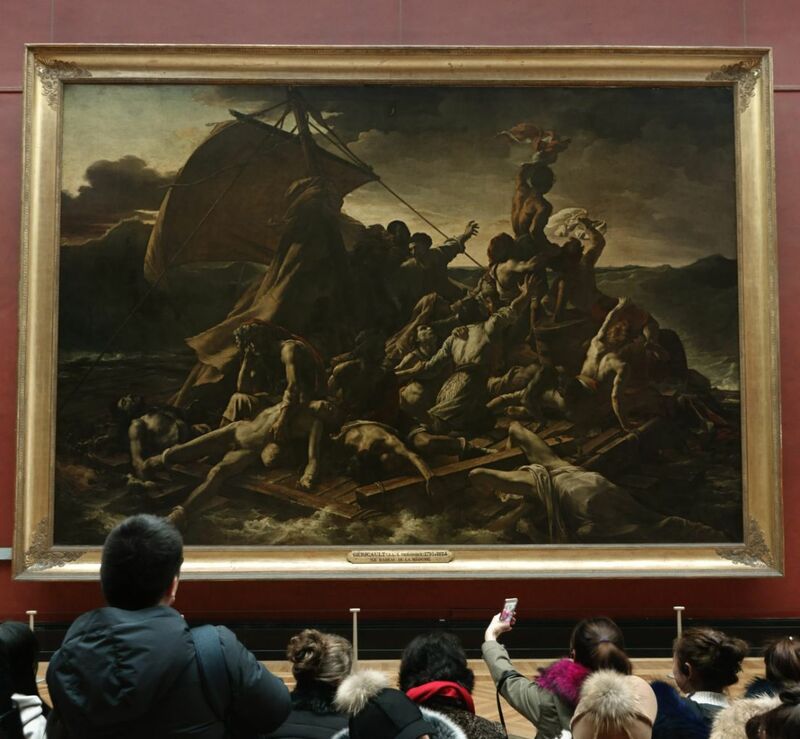 The tragedy Delavie was referring to not only inspired public debate and outcry, but was also the subject of a monumental artwork, “Raft of the Medusa”, which remains one of the most important works in the Louvre. Five meters by seven, it begs attention. The scene painted by the young artist Theodore Gericault shows the entire range of human emotions. The bottom of the painting and its left are ruled by shadows, torment, sadness, and death. On the right side, the lighted one, the eye is drawn to a young dark-skinned man brandishing a red strip of material toward a ship that one can, barely, see over the horizon. At the center, a man with reddened eyes points at the ship and encourages his journey-mates. The picture depicts the final scene of a hell on earth drama, which actually took place. It was a 13-day human tragedy with only a few survivors who could tell its tale. The tired man at the painting’s center was one of them, a man named Alexandre Correard, a 28-year-old geographer and engineer and one of the 392 passengers who boarded the ship Medusa on June 17, 1816. "At the height of the most cruel horrors we swore that if God let us see our dear land once again, we would tell the civilized world about our terrible adventure in great detail." The Medusa never reached its destination. After hitting a shoal, 80 kilometers off the Saharan coast, the boat became the backdrop for an exquisite exhibit of the ills of French society. At a time of crisis, social class took on a life and death significance, and those who found themselves on the wrong side of the power differential had to shake off any vestige of humanity in order to survive: this included betrayal, murder and cannibalism, interlinked in a terrifying scenario that led to the death of more than 150 people. The Medusa was the largest and most important of four vessels that left France for Africa at the behest of the new king, Louis XVIII, younger brother of Louis XVI who had been executed during the French Revolution. The sailing of this delegation was a highly significant event, the purpose of which was to repopulate the colony of Senegal with diplomats and military personnel. On board was Senegal’s governor, Col. Julien-Désiré Schmalz, accompanied by his wife and daughters. The captain was Hugues Duroy de Chaumareys an emigré aristocrat who had fled the terrors of the revolution. On board were also 200 soldiers who had once fought for Napoleon but were now in the service of the new king, and tradesmen needed in the colony – carpenters, masons, scientists and medical personnel. The voyage proceeded relatively smoothly for two weeks. However, the ship’s captain, Duroy de Chaumareys, who had not commanded a boat for 25 years, did not observe the rules of navigation. Apparently, in attempting to reach his destination sooner, he brought the boat too close to the shores of Mauritania, still considered a dangerous route to this day. The inevitable happened on the afternoon of July 2, when the boat came to a halt with a wrenching thud, as it is described by Correard and Savigny in their book. "The ship was stopped with a violent blow, continued sailing for a short time, and was hit a second time, and then a third. It stopped in a place where the depth of the water was only five meters and 60 cm. at high tide. Everyone on deck was in shock. "Several people were unidentifiable: Here an ugly and defeated face was seen, there a green to yellow face, others were as though struck by lightning – destroyed to the foundations, along with some who remained in place as though bound with chains – unable to move. Petrified as though this moment was passing by them. After the shock of the first moments, countless people began shouting in despair." The crew and passengers tried to extricate the grounded vessel for two days but it was finally decided to abandon ship. Then a new problem surfaced – the six lifeboats were far from sufficing for the 400 passengers. "A council was convened, at which the ruler of Senegal announced a plan to build a raft that could carry 200 people and supplies of food and drink. The supplies were supposed to be kept on the raft, and during mealtimes the other boats were supposed to come and take their portions. "We received many tempting promises, in order to conceal from us the depth of the disaster to which we had been led: They also told us that 120,000 francs that were on the ship would be kept on the raft, and in case one of the lifeboats sank, its passengers would find refuge on the raft." The governor of Senegal ordered a raft built that would be capable of carrying 200 people with water and provisions. When the passengers were divided among the lifeboats and the raft, not surprisingly, but nevertheless disturbingly, the upper classes and senior officers ended up occupying the more secure berths. 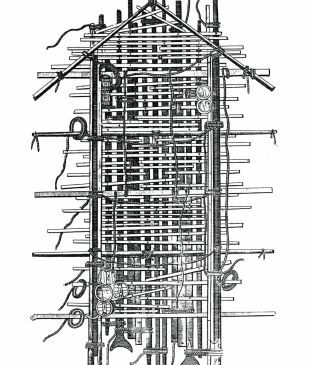 The rest, simple sailors and soldiers and passengers from the lower classes were placed on the completed raft, dubbed “the machine.” It consisted of a 20-meter-long and seven-meter-wide wooden surface. It was quite stable but incapable of carrying the load placed on it. "We were 152. The engine sank under our weight to a depth of one meter. We were so crowded that it was impossible to take even a single step in any direction. At the front and the back of the raft the water reached waist height." "When we got underway they threw a package of biscuits in a sack at us from the ship, but it fell into the sea. We barely managed to pull it out, the biscuits turned into a paste. We kept it anyway When things calmed down, we decided to look for the maps, the compass and the anchor that we thought had been given to us. These essential items weren't found." At first, the people in the lifeboats adhered to the original rescue plan and towed the raft behind them, as they headed for the coast. “They realized this was impossible,” Accera says. “The sea was stormy and the raft sank under the weight of its passengers. "They cut the ropes and the raft was cast adrift. You can’t navigate a raft and they didn’t have the means to do it, anyway." And so, 152 people were abandoned at sea. As the first night fell, the weather deteriorated. "We fought death all night long. We held the ropes tightly, rolling backward and forward from the power of the waves, floating between life and death, thinking about our bad luck, convinced of our imminent end but preserving a vestige of existence far from the embrace of the forces of nature. That's how we spent the hours until morning. At every moment we heard the pathetic cries of soldiers or sailors. They prepared for their death, uttered words of farewell and pleaded to the heavens." By morning the number of passengers on the raft had decreased, after 20 people had been swept away. This bitter discovery at daybreak crushed the remaining passengers’ spirits, and the first suicides took place on the second day. "Two young sailors and one baker were not afraid to jump into the sea, thereby bringing their lives to an end. This was after bidding farewell to their friends." At this point, write Correard and Savigny, powerful delusions started clouding the judgement of those around them. But nothing could match the horrific violence which erupted at the second day’s nightfall. "The soldiers and the sailors believed that this was their final hour. They decided to sweeten their remaining moments and to drink themselves insensible ... In an ecstasy, those men who had lost the voice of reason tried to lead their friends-in-need to their shared end. They declared their intention of getting rid of the commanders, and then destroying the raft by cutting the ropes that held it together the signal for mutiny was given." The harsh battle described by Savigny and Correard place most of the soldiers on one side, with junior officers and civilians on the other. Throughout the night knife and sword thrusts were exchanged, with many people were thrown overboard. "Several voices called to remove the sail. The masses stormed the ropes and began to cut them. The collapse of the mast almost broke the thigh of an officer, who fell unconscious. The soldiers grabbed him and threw him into the sea. We pulled him out of the water and placed him next to a barrel, but he was grabbed once again by the rioters and they tried to gouge out his eyes with a knife. When we saw their cruelty we attacked them furiously. With swords in hand, we crossed the lines of the soldiers. Many of them paid with their lives." "Shortly after midnight, after a relatively quiet hour had passed, the soldiers attacked us again. They ran toward us in despair, with knife or sword in hand. They attacked, us, we did the same to them, and shortly afterward the raft was covered with their bodies." Between sunset on the second day and sunrise on the third, more than 60 people died. In the course of the fighting what little water and wine remained on the raft wound up being cast into the sea. Only two barrels, containing 400 liters (105 gallons) of wine, remained, Correard and Savigny wrote. "The unfortunates who had been spared by death during that terrible night fell upon the bodies that covered the raft, cut them into pieces or devoured them as they were. The officers didn't touch them at first. When we saw that this disgusting food renewed the strength of those who ate it, we suggested drying the meat to make its taste somewhat more tolerable. Those who had the strength to refrain received a large quantity of wine. Some ate fabric, others chewed the leather of the hats that had a little oil on them, or contaminated milk." Hunger, thirst, injuries sustained during the fighting and their mental state quickly depleted the number of survivors. "The morning sun of the fourth day illuminated our disaster and revealed 10 or 12 of our friends lying lifeless on the raft. The sight shocked us, because it reminded us that soon it would be our bodies lying in the same place. We buried the dead at sea and kept only one of them, so that he would feed those who the night before still held his trembling hands and promised him eternal friendship." By the fifth day there were only 30 people on the raft, but their condition was rapidly deteriorating, according to Correard and Savigny. "The seawater removed the epidermis from the lower part of our torsos almost entirely. We were covered with one huge wound, which released cries of pain from our throats every time the water touched us." However, some of them thought the dying wasn’t fast enough. "There were 27 of us left, and it looked as though only 15 would survive for a few more days. The others, covered with serious wounds, lost the voice of reason. However, they received a portion of wine, and according to our calculations, they could consume before they died 30 or 40 bottles of wine, which were precious to us. We discussed the options: To give the sick half a portion meant to sentence them to death. After a consultation that took place in the harshest atmosphere of despair, we decided to throw them into the sea. "This method, which seemed even to us to be terrible and disgusting, gave the rest of us six days with portions of wine. But from the moment the decision was made – who would dare to carry it out? Being in the presence of death and of the knowledge that we would die if we didn't do what had been decided hardened our hearts, which became insensitive to any feeling other than the will to survive. Three sailors and one soldier volunteered for the task. We looked aside and wiped away tears of blood at the fate of our friends." While resorting to cannibalism is what brought the story of the raft to public attention, it is this moment in which 12 people were murdered in cold blood, which bothers experts today. 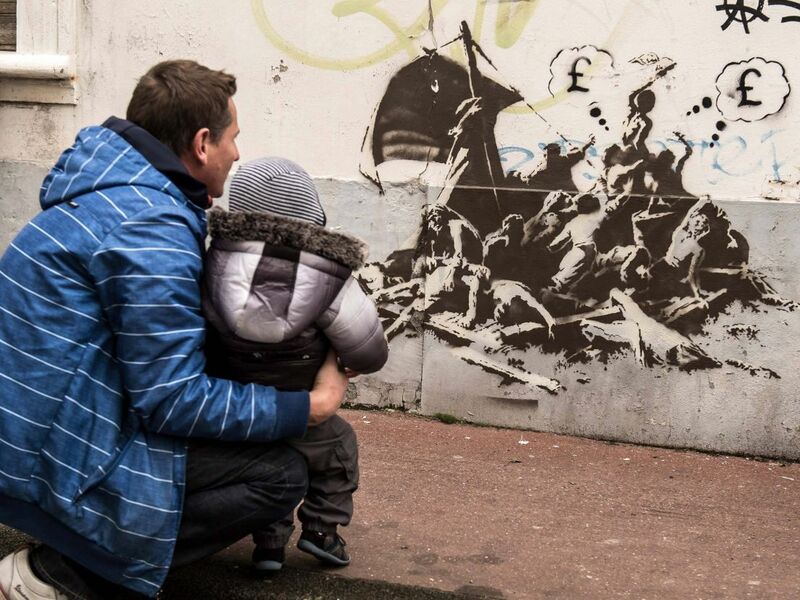 A man and his child look at a street art take by Britain's Bansky on Gericault's masterpiece 'The Raft of the Medusa' in Calais, France, 2015, the site of a former migrant camp. However, Alain Morgat, the director of archives for the Haute-Marne region in France and former director of the French naval archives, finds it hard to believe Correard and Savigny’s version of this moment. Once the wounded were thrown off the raft, things became a bit easier. On the 13th day the survivors noticed the masts of a boat far on the horizon, but it quickly disappeared. "From the ecstasy of happiness we sank into despair and pain. We lay down on the wooden surface, which had been a witness to the most cruel suffering, and decided to wait for death. We sought consolation in the arms of sleep. A day earlier the sun had devoured us with its rays, and therefore that day we decided to set up a tent in order to hide from its vitality. From the moment it was built, we lay under it and didn't see what was happening around us. "We came out from under the tent. Even those who had spent the past days lying down because of the wounds in their lower limbs dragged themselves to the back of the raft in order to rejoice at the sight of the ship. We embraced one another and rejoiced in a manner bordering on insanity. Tears of happiness rolled down our dried up cheeks." Five of the survivors died of serious injuries over the next few days. Finally, only 10 of the 152 men who had boarded the raft survived. Furthermore, of the 17 of those left behind on the Medusa, only three were found alive. The others apparently chose to end their lives by jumping overboard. A copy of Correard and Savigny’s book landed in the hands of 26-year-old painter Theodore Gericault, igniting him with an obsession. The artist, who wished to leave his mark on the art world of his day, decided to immortalize the drama, and did so in a manner which broke with all conventions. 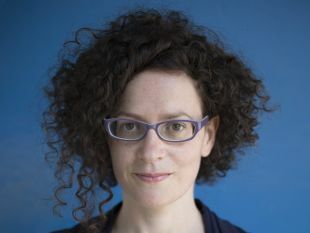 “There had been paintings dealing with contemporary politics before then, but not like that,” says Dr. Tamar Meir, a researcher of 19th-century French art and lecturer at Tel Aviv University. The first difference between Gericault’s work and preceding ones is an economic one: “It wasn’t a commissioned painting” says Meir. “His was a new model of an independent artist working not under the tutelage of a patron. This enabled him to do things that were not possible previously.” Gericault’s choice of artistic freedom came at a price. 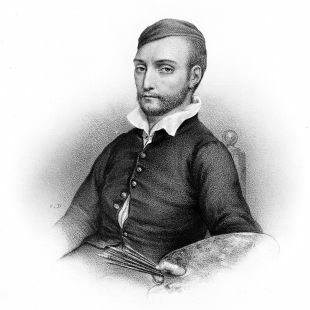 Gericault met Correard and Savigny many times, as well as a third survivor from the raft, a carpenter called Lavilette. Based on their testimony and the skills of Lavilette a small model of “the machine” was reconstructed and the artist began studying the various experiences the raft’s occupiers had gone through. In his sketches he drew scenes of cannibalism, then decided to leave them out of the final version, possibly out of concern that they would be censored or not displayed at the Paris salon he was designating the painting for. In order to accurately depict the horror he went to hospitals and morgues, studying bodies and their anatomy. His close friend, the painter Eugene Delacroix, modeled one of the figures lying at the front of the raft. Correard himself is immortalized at the center, with his arm raised, and it is said that Savigny is one of the figures standing in the shadows. Meir explains that paintings from this genre usually depict biblical or mythological scenes, to provide role models for appropriate conduct. “Here Gericault was taking a contemporary scene and a very controversial topic. He shows victims. After more than two years of strenuous work the Medusa Raft was shown to the public at the 1819 salon, creating an uproar. “The painting assailed public consciousness at the time” says Come Fabre, a curator at the Louvre’s painting department, responsible for 19th century work. This was no coincidence. Gericault chose to place several black people on the raft, in contrast to the facts. Only one black soldier survived the 13 days at sea, succumbing later to his wounds after being rescued. In this manner, Gericault charged his painting with far-reaching political significance. For years it was claimed that the Raft of the Medusa was actually a manifesto against slavery, aimed at the monarchy that permitted it. “He wanted to show the equality of man when facing terror and death” explains curator Fabre. “The fact that the pyramid is headed by a black man waving at the distant boat testifies to Gericault’s heightened sensitivity towards blacks in particular and marginalized people in general. Gericault is considered a pioneer of the Romantic Movement and the Raft of the Medusa is one of the key paintings heralding it. A year after the Paris salon he went to London, enjoying wide success there, with tens of thousands of visitors coming to see his painting. However, his career was brief. Ever since then, the masterpiece is considered to be one of the gems of French culture. “The Louvre considers it one of the most important paintings in its possession,” says Fabre.